Saturday’s matchup against Texas State (3-3, 0-2) is still an opportunity for Georgia State football to make history this season. The Panthers (0-6, 0-1) failed to make history on Saturday in their homecoming game when they lost 35-28 to Troy, which would have ended their homecoming game losing streak. The last homecoming game Georgia State won was in the 2011 season when they defeated South Alabama 27-20 in double overtime. However, the Panthers will have an opportunity to break the losing streak by defeating the Bobcats this Saturday to capture their first win since Oct. 13, 2012 when they defeated Rhode Island 41-7. Saturday’s matchup will also be Georgia State’s first away Sun Belt Conference game and the first time that they face Texas State in football. Georgia State is not the only football program who made their conference debut this October. Texas State has played two conference games, losing 48-24 to Louisiana-Lafayette on Oct. 5 and losing 21-14 to Louisiana Monroe on Saturday. In the Bobcats’ loss to the Warhawks on Saturday, junior place kicker/punter Jason Dann made two field goals of 22 yards and 43 yards. Texas State started their transition from the FCS to the FBS in 2011, so they’re now eligible to compete in postseason bowl games and for the conference championship. Meanwhile, Georgia State didn’t start their transition until 2012 so it won’t be until the 2014 season that they can compete. 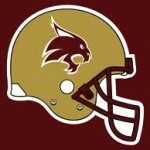 Texas State competed in the Southland Conference (FCS) until 2011 where they competed as an FCS independent as they began the transition to become a member of the FBS. The initial plan for the Bobcats was to become a FBS member to compete as a member of the Western Athletic Conference. However, the WAC discontinued sponsoring football after the 2012-13 season, so their stint in the conference was short-lived. Like Georgia State, Texas State accepted the invitation to join the Sun Belt Conference in 2012. Neither program has captured a conference win. Saturday’s matchup can go in the Panthers’ favor if they can stop the run that they struggled with all season. Georgia State is last in the Sun Belt in stopping the run, allowing 249.0 rushing yards per game. The Panthers allowed 105 yards against Samford, 401 yards against Chattanooga, 245 yards against West Virginia, 122 against Jacksonville State, 181 yards against Alabama and 249 yards against Troy. Unfortunately, Texas State is ranked third in rushing offense in the conference, averaging 165.0 rushing yards per game. The Bobcats had 210 rushing yards on Saturday against Louisiana Monroe. Sophomore running back Robert Lowe led the team in rushing with 22 carries for 140 yards and a touchdown. On offense, the Panthers’ strength is their passing game where they are ranked third in pass offense in the Sun Belt, averaging 370.0 yards per game. In Saturday’s loss against the Trojans, redshirt sophomore quarterback Ronnie Bell completed 22 out of 50 passes for 370 yards passing. Senior wide receiver Albert Wilson led the team in receptions with seven for 153 yards and two touchdowns. 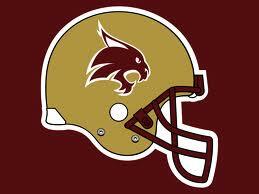 However, Texas State is ranked second in pass defense, allowing 236.0 yards per game. The Bobcats allowed 112 yards passing against Louisiana Monroe on Saturday. Saturday’s road game will kick off at 7 p.m. and will be televised on the Sun Belt Network and broadcast on radio on 1340 AM and WRAS 88.5 FM.